The following message was sent to all faculty in an E-News on September 13. A faculty vote on the Tentative Agreement will take place by the end of September. Details of the voting process will be sent to all faculty very soon. -Ed. As I said on Opening Day, the District and AFT 1493 negotiating teams reached a Tentative Agreement (TA) this summer for a new collective bargaining agreement, and, as I promised, the AFT Executive Committee (EC) considered this TA at its August 19th retreat. At that time, the EC voted to submit the TA for ratification to the faculty, with a recommendation that faculty vote in favor of ratification. Subsequently, on August 24th, the Board of Trustees voted 4-1 to approve salary improvements for academic and classified supervisors, a group of employees not represented by any union (Board Packet 9.7.11 see Minutes of 8.24.11). In voting in favor of these salary improvements, the Board relied on faulty assumptions regarding faculty salary comparisons to other districts. Board Report #11-8-2A stated, “To be consistent with the District’s salary range reviews of AFT and CSEA, staff determined that new classified and academic supervisory salary ranges should rank within the top three or four of the comparison districts” (Board Packet 8.24.11, see Exempt Academic and Classified Supervisory Salary Schedule). This statement rests on an erroneous assumption that AFT members’ salaries are already within the top three or four of the comparison districts, but in fact the salaries of a majority of our faculty are below the top three or four districts. The Board minutes from the August 24 meeting indicate that the District conducted a salary survey to determine comparable compensation for academic and classified supervisors in Spring 2011. At no time during negotiations with AFT, however, did the District negotiating team give any indication that while it was asking faculty to accept a wage freeze, the District was concurrently studying a salary increase for supervisors. In light of this recent Board action, AFT held a special meeting on September 7th. 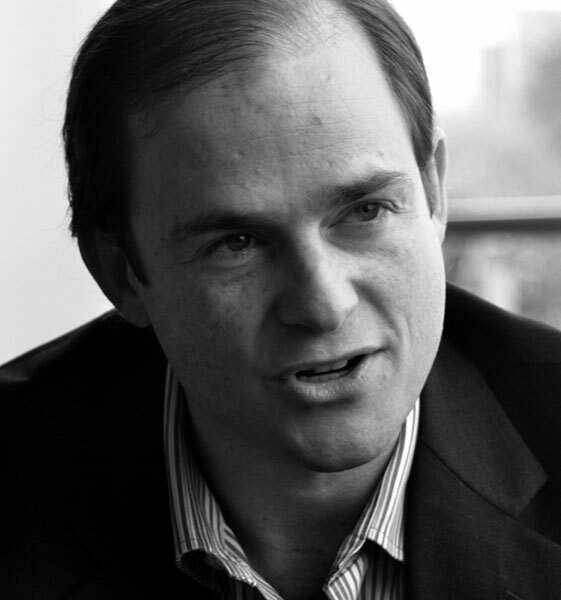 Considering that during more than two years of negotiations and mediation our team was repeatedly and forcefully told that there was no funding for any salary improvements, the Executive Committee voted to rescind its prior recommendation that faculty vote in favor of ratification (those EC members that serve on the negotiating team have recused themselves from this process). Accordingly, AFT 1493 will submit the TA to the faculty for a ratification vote as previously announced, but without its prior recommendation in favor of ratification. The Executive Committee came to this decision in order to uphold the principle that all district employees should be treated with fairness and equity. lights of the tentative contract agreement (TA) between the AFT and the District. The complete TA is accessible on the AFT 1493 website, aft1493.org. • Professional Development funding shall remain at 1% and ALL unused funds may be carried over from year to year — the new carryover language represents a gain from previous contract language. Changes that were suggested by the Professional Development Committees to improve the program were also incorporated in this agreement. • The current contract guarantees that once granted, a post-retirement contract will be for three years. Because of this, the District has been reluctant to grant any post-retirement contracts during the past few years. The changes allow for a faculty member to negotiate a post-retirement contract for up to three years and the agreed upon length will be specified in a contract between the faculty member and the corresponding administrator. “The Local View” is a new column that is taking the place of the long-running “President’s Letter” column. The goal of “The Local View” is to provide a forum for a range of voices from our Local, AFT 1493. These voices will include AFT 1493 Executive Committee members, such as this issue’s author, Elizabeth Terzakis, as well as any member of our union. If you are interested in submitting an article for “The Local View”, please contact Dan Kaplan at kaplan@smccd.edu. At the AFT Executive Committee (EC) meeting on August 19th, I voted, with most of the rest of the EC, to send the recently negotiated Tentative Agreement (TA) forward to the membership with a recommendation that faculty vote in favor of ratification. I was ambivalent about it, but, as I explained to my fellow EC members, I voted yes because I felt that it was the best we could do given the context—the condition of the state budget as well as the District’s insistence that they couldn’t afford increases for anyone. The District had come into negotiations looking for column and step freezes, among other concessions, and the negotiators had brushed them back. Although we would suffer (another) de facto pay cut because we would be getting no COLA (again) and the District refused to raise its contribution to health care expenses, at least our salary schedule would remain intact. I held this attitude of resigned acceptance for four days. On the fifth day, I heard about the Board of Trustees’ (BOT) decision to award salary improvements to administrative and faculty supervisors. The District claims that these increases will only cost them $54,000. I don’t care what it costs them. You cannot tell one group of people, repeatedly, over the course of two years (because, remember, our contract expired in 2009), that there is no money for anything and then turn around and award salary increases to another group of people. It is deceptive and insulting. Don’t get me wrong; I don’t believe that the increase will only cost the District $54,000. Perhaps that is because when I get lied to once (“There is NO money”), it primes me to be on the lookout for the next lie. Stay tuned to this space for future number crunching. (See actual data on the supervisors’ increases on page 5. -Ed.) But, whatever the cost, I find the principle of the thing bothersome. In its justification of the increases, the District claimed that this group of workers’ salaries had never been reviewed and brought into line with surrounding districts, whereas the salaries of members of collective bargaining units are reviewed every time a contract is negotiated. This may be true, but when the salaries of those of us in AFT were reviewed (see “Comparing Bay 10…part-time salaries”, above), the District must have noticed that our part-timers rank between 5th and 7th among nearby districts, behind Marin, San Francisco, Foothill-De Anza, and others. But there is no stampede to equity when it comes to the lowest paid, most vulnerable section of our workforce. Because when educators ask for money, we are told that there is none. At the first Cañada Budget Meeting of this semester, Interim President James Keller assured us that more budget cuts are coming down the pike, so we will all have to think about how we are going to sacrifice. I am sure similar things were said at the other campuses. This reminded me that, in 2008, just before the first wave of the budget crisis hit, the BOT voted to give administrators salary increases, the cost of which was also much larger than they said it would be. The impact of this decision is reviewed in graphic detail on page 4, so I won’t repeat it here, but all should note that this is not the first time that the District has taken this kind of action. At the time, we expressed our anger and spoke out against the decision, but we did not take any organized action. Now, because of the timing of our negotiations and the BOT’s decision, we have an opportunity to express our displeasure concretely. If the faculty vote down the Tentative Agreement, the District will be forced to go back to the bargaining table, and we can remind them how committed to equity they are. Perhaps we can reinstate cut sections; that will benefit both part-time faculty and students who are scrambling for classes. Perhaps we can campaign for wage increases for part-timers, or for our thirty-year veterans who are stuck at the low end of salary comparisons with other Bay Area districts. If faculty members decide to vote no on the Tentative Agreement, they should also think about what they want—and what they are willing to do to support the negotiating team. The more united and organized we are, the better chance we have of getting an equitable agreement. The District has maintained that they are equitable in giving all employee groups comparable salary adjustments. Our faculty’s salary schedule has not increased since Fall 2007, which means that for the last four years SMCCD faculty members have only received salary increases if they have received step increases. 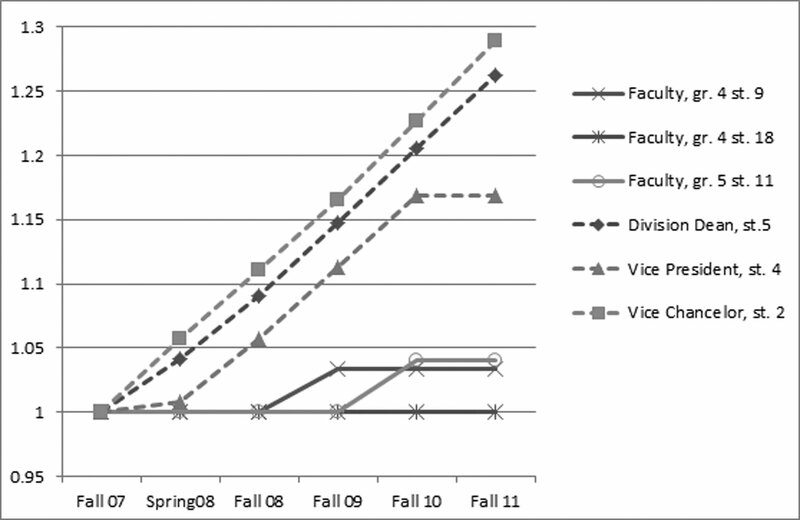 Since faculty salary schedules have numerous “plateaus”, during which no step increases are provided for multiple years, many faculty members have received no increase or just one increase over the last four years. Administrative salary schedules, however, were raised significantly in January 2008 to a new 6-step salary schedule. At that time administrators were given an immediate raise to either step 1 of their new salary schedule or (if their salary on the old schedule was higher than the new step 1) to whatever step on the new salary schedule that would give them a raise from their previous salary. (Administrators were the only employee group to be given salary increases in the middle of that academic year. Those raises were in addition to the COLA increases that were given at the beginning of the 2007-08 year.) The step increases on the new administrative schedule gives step increases of $5,000-$10,000, in the range of 5% per year for each of the annual steps. Faculty step increases are mostly in the range $2,760 – $2,815, which ranges from about 2.9% for grade 5, step 23 to 4.8% for grade 2, step 1. (Of course, when any employee reaches the top step, they receive no more step increases.) We tracked and compared a few examples of management salaries with a few relatively typical faculty salaries to show how equitable administrators’ and faculty step increases have been since Fall 2007, just before the administrators were given their new salary schedules. At the beginning of this semester, academic and classified supervisors received a new increased salary schedule. 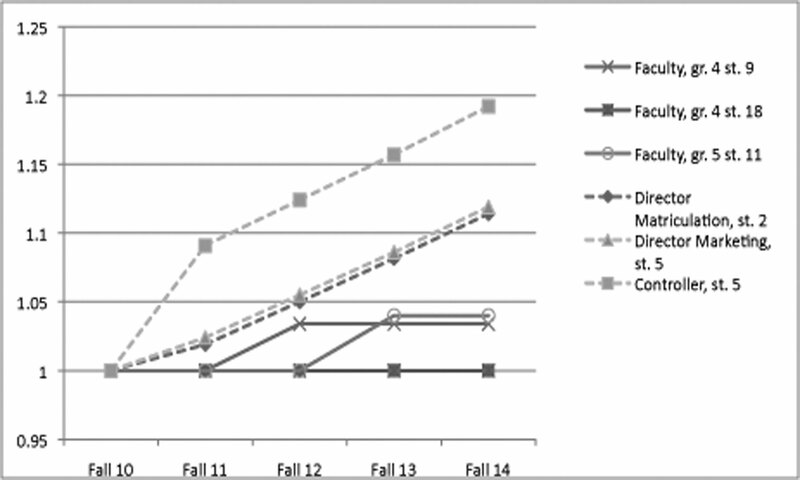 To compare faculty salary increases with those of some employees on the supervisors’ salary schedule, we looked at future step increases of three different supervisory job classifications for the next four years compared to same relatively typical faculty salaries we used to compare with management salaries. Our comparison does not include any adjustments to either salary schedule during the time period studied. The next morning AFT leaders had two separate meetings at the San Mateo Labor Council offices with the two other incumbents running for re-election to the Board, Karen Schwarz and Pat Miljanich. Representatives from the other two SMCCCD unions also participated. On September 12, the Labor Council voted to endorse 4 candidates for the 3 open seats on the SMCCCD Board of Trustees: Pat Miljanich, Karen Schwarz, Dave Mandelkern, and Joe Ross. On September 14, at its regularly scheduled September meeting, the AFT 1493 EC had a full discussion of all of the candidates running for the Board. The discussion focused on the actions taken by the Board over the last four years. Among other issues discussed was the recent decision by the Board to grant salary improvements to supervisory employees, much like the restructuring of the salary schedules for other management employees in December 2007. This was done while AFT was told repeatedly in negotiations that there was no money to make any improvements in the faculty salary schedule. Another focus of the discussion was the overturning by the Board of a decision of an arbitrator who had ruled in favor of the AFT’s position, something that the Board can currently do given that AFT doesn’t have binding arbitration in our contract. In our conversations with all of the incumbents now on the Board, each of the Trustees spoke strongly against even trying binding arbitration on an experimental basis as the final stage in the grievance process. Yet most districts represented by CFT have binding arbitration in their contracts. For these reasons, among others, the AFT 1493 EC voted not to endorse any of the incumbent candidates running for re-election to the Board, and to urge the faculty who live in San Mateo County to vote for Joe Ross for the SMCCCD Board of Trustees. My mother died when I was five. My father, who worked for the post office, had been disabled in an accident and was unable by himself to take care of me. So I was adopted within the family into a new household. My aunt and uncle gave me a new name. Even though I still saw my father every week I learned to call him “Bob” and to call my uncle “Hank” because both had legitimate claims to be called “Dad” and I guess I wouldn’t choose. My aunt, on the other hand, became “Mom” to me. It was an early lesson that a lot in life can just happen outside of one’s own control. But I was lucky because the caring adults in my life made it clear that if I stayed in school, graduated from high school, and went to college, things wouldn’t always just happen. Instead I could be the boss of my own future. So I became a zealous nerd. I graduated from high school, went to college, and have tried to have a life where I make things happen rather than just let them happen. Inspiring kids to go to college – so they can makes things happen – is the heart of my work at Citizen Schools, a national afterschool program with its California headquarters in Redwood City. Many of the students we serve come from environments where it may seem as though things just happen in life, outside of one’s control. But when an engineer from Cisco or Google volunteers to teach robotics, bringing math and science concepts to life, or when an architect teaches building design, bringing scale and measurement to life, or when a lawyer teaches mock trial, bringing literacy to life, the message is clear: if you stay in school, if you succeed in school, if you graduate from high school and go to college, you can be the boss of your future. Now, there are a lot of “ifs” there, and the decision about those ifs happens, consciously or subconsciously, in middle school. Which is why Citizen Schools is there. But the unfortunate reality is that in many of our communities less than 50% will graduate from high school. Of those who do, very few will have taken the 15 “A through G” required courses they need to qualify for a four-year college acceptance within the UC or CSU systems. In fact about 70% of all San Mateo County high school graduates find themselves in this situation. Yet more students cannot easily afford the UC or CSU tuition over four years. For these young adults, San Mateo community colleges provide the best and only path to a college degree. The College of San Mateo, Cañada College and Skyline College also provide tens of thousands of residents access to skills and job training. But budget cuts have forced unacceptable choices. Forty thousand students attend high-quality classes within the SMCCC district but only a few thousand attain certificates, degrees or transfer eligibility each year. While the statistics and budget cuts are brutal, we who work in education know that there remains reason for faith. Reason number one for us to have faith, in fact, is our community college system. My wife Adriana, who grew up in Colombia, first attended community college in San Diego, where we lived during the last years of my U.S. Navy service. We had three kids already and she spoke little English. Frequent deployments had strained our parental juggling act and I decided to pursue meaningful work outside of the military. We moved to the Bay Area so I could attend Stanford Law School while Adriana continued working on her transfer credits. We were both full-time students so even with a full scholarship from Stanford and the GI Bill we still had to take on a lifetime of student loans to pay for daycare. After several years of zealous effort, Adriana successfully learned English, transferred to SJSU, attained a BA in Spanish, and with a McNair Scholarship and generous fellowships attended Stanford to obtain a degree in Latin American studies. Now she works for a small company providing budgeting tools for first-generation Spanish-speaking immigrants. Success stories like this need to be told. More urgently, the obstacles to student success must be told, too. My commitment is to bring many more voices to the effort to strengthen community colleges, and to work collaboratively with all of the college constituencies, including faculty, staff, students, and families, to find ways to preserve quality, increase student success and grow the movement advocating for community colleges – not just in Sacramento but throughout our communities. We need to build a movement, not just for more resources but for new ideas. One way to improve success, for example, would be to increase the numbers of full-time faculty. Transparent budgets would reveal the true costs of under-committing to full-time staff. To make the case, however, we also need to engage as many people as possible to understand that this goes beyond employee equity. One of the reasons few students successfully complete a degree or certificate within two years is there are not enough full-time personnel on campus to provide advice to students and engage in mentoring relationships. My background prepares me well for this work. As a parent of school-age children, I will engage the K-12 parent community to think about education as a K-14 ecosystem. As a former technology company employee – I spent three years after law school working to pay down my student loans – I will engage the business community to recognize the best way to prepare workers for a modern economy is to invest in community colleges. As a veteran, I will engage military families to support community colleges because national security depends on education. And as a union worker’s child, I will collaborate closely with unions to identify and surface the best ideas, which always come from the people working closest to the problem. Together I know we can make things happen. Harriet Tucker: 20 years working for AFT 1493! 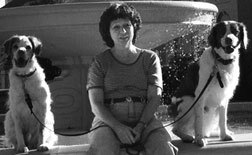 Harriet Tucker has worked under the Presidencies of Diane Lebow, Joaquin Rivera, Joaquin Rivera and Katharine Harer, Cliff Denney, Ernie Rodriguez, and now Monica Malamud. Over these past 20 years, Harriet has shared an office with three Executive Secretaries who have worked for AFT 1493 over the years, Joe Berry, Mary Kay Stegner, and Dan Kaplan. Those 20 years of employment with AFT 1493 means that if you have ever called the AFT office, there is a very good chance that you have spoken with Harriet, and that she has either answered your question herself or has helped you get in touch with a person who could help you solve whatever problem or question that you had. Over the years, Harriet’s responsibilities in the AFT office have evolved. Initially, Harriet was responsible for maintaining the AFT database. She then became the AFT Office Manager, responsible for helping to coordinate the myriad tasks related to the functioning of the union office. Later, Harriet became involved in keeping the financial records for the Union, working closely with the AFT Treasurer. Harriet came to the AFT in 1991, after having spent several years teaching Junior High School French. She has an M.A. in French from Brooklyn College, with a minor in Education. She grew up in New York City, specifically in Brooklyn. Her father was a painter, and a member of the Painters Union in New York City. Harriet is the proud mother of two adult children. Her daughter, Naomi Tucker, is the Executive Director of Shalom Bayit, and her son, Jeff Tucker, works for the San Francisco Giants as a Vice-President of Ticket Sales. And she is the proud grandmother of three: Anya, Mollie, and Brenna. She lives in San Francisco with Riley and Banjo, her two beloved Brittanys, whom she trains and shows. Thank you, Harriet, for 20 years of helping in so many ways to represent the interests of the faculty in the San Mateo Community College District. To put Proposition 1481, the oil extraction tax to fund public education, on the ballot, volunteers throughout the state will have to collect 504,760 valid signatures of registered California voters by September 30. It is estimated that the initiative, which would impose a 15% tax on each barrel of oil extracted in California, would raise $3 to $3.5 billion annually to fund the 4 sectors of public education: 30% to K-12, 48% to Community Colleges, 11% to CSU and 11% to UC. Over 260,000 petitions have been printed and around 85% of the petitions (each has space for 5 signatures) are in the field. A few weeks ago, when many schools were just beginning the fall semester, lead proponent Peter Mathews, a Cypress College political science instructor, estimated that volunteers throughout the state had collected about 60,000 signatures. Now that figure is much higher. If we succeed in qualifying the initiative, the people of California will have an opportunity to vote to support the 9 million public school students in Kindergarten through the University of California. The students in higher education, especially the 2.7 community college students, are leading this effort to improve a once great educational system that a dysfunctional legislature has battered and neglected. The California Legislature has yet to discover any connection between equitable taxation and the common good (at least they haven’t been able to get a two-thirds vote for any such thing.) In fact, their tax-phobic legislation has widened the gap between the super-rich and the rest of us. 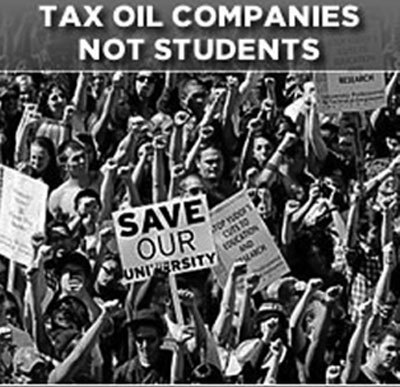 California is the only major oil-producing state that has no oil extraction tax and the oil companies are reaping excessive profits while schools are experiencing massive cuts in classes and services, faculty and staff layoffs, and increases in tuition and fees (19% for UC students, 23% for CSU students and 38% for Community College students this year.) When students have heard about Prop. 1481, they’ve become energized; and faculty, staff and administrators throughout the state have joined them. San Francisco City College Student Trustee Jeffrey Fang and Board of Trustees President John Rizzo submitted a resolution to endorse Prop.1481, which the CCSF Board of Trustees passed unanimously on Aug. 27. AFT Local 1493, along with AFT 2121, the San Francisco Labor Council, and the San Francisco City College Board of Trustees, have led their counterparts throughout the state in endorsing the initiative. At colleges in the San Mateo District, students are enthusiastically circulating petitions. The educational community and our allies expect continuing contributions of money, signature-gathering efforts, endorsements, and help shaping a comprehensive, strategic cyber campaign. For volunteers to get a statewide initiative on the ballot is unprecedented, but so is the righteous anger–and the enlightened self-interest of 3 million students in public higher education. They and their allies see a connection between the top 2% of the population controlling two-thirds of our nation’s wealth at a time when students fortunate enough to get a bachelor’s degree end up owing on average $22,900. Be it resolved, that the AFT 1493 Executive Committee recommend that full-time faculty members seriously consider refraining from taking on excessive overload in situations where part-time faculty will be displaced from courses to which they would have otherwise been assigned.